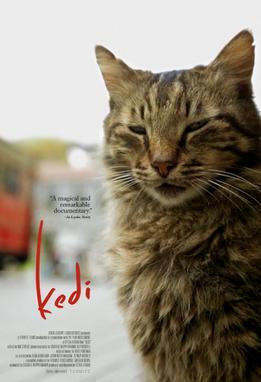 Kedi is a 2016 documentary about feral cats, or street cats as they are called in the film, in Istanbul. This makes it seem more niche than it is. It is a foreign-language film, but it will be of interest to anyone who likes anthrozoology or observing the psychological relationships between humans and other species. The film is at pains to point out at the start that the cats have been native to the area for a millennium or more. This suggestion of the depth of time elucidates a premise of the film which is expounded upon in detail later, which is the way the local population seem to deify the cats just as Hindus revere cows. There is talk in the interviews of acting as intermediaries between the cats and God as they feed them and shelter them. At one point, a man says he believes dogs think that humans are God, but cats recognise that humans are just the middleman. As one would expect, this is accompanied by a good deal of anthropomorphising, and just as equally one sees the cats behaving in ways that seem to imitate humans with no external prompting in that direction, such as watching TV, which shows how much the city environment has changed them. One could compare it to the disposition of foxes in the UK, which become bolder and more acclimatised to the urban ecosystem with every passing year. The camerawork is masterly and fun. A good deal of the time, maybe three-quarters of the time, the camera hangs at the eye level of the cat. You do not see human faces often apart from the interviewees. The narrative plays out as a series of vignettes about the individual cats profiled in the film, told from the perspective of their human caretakers for whom the cats have become part of the texture of daily life. In fact, the cats seem a universal therapeutic mechanism for the inhabitants of the city. One woman says she came to love a huge troupe of them after recovering from some unnamed sickness. Someone else says that his fondness for them came after one of them pointed him towards a discarded wallet on the ground with just the right amount of money, so he says, when an unfortunate series of events bankrupted him. Seeing the interactions of the interviewees gives the viewer some idea of the constancies of life in the city as well, such as one incident where people at a cafe were playing backgammon. As ancient as the game is, I have never seen anyone play it in real life, so this was a novel stimulus. Some viewers would doubt the existence of consciousness in nonhuman sentience, but most of the people interviewed for the film would contest that. As they say, the cats have their distinctive character traits, which you can see in their facial expressions, hence the specialised camerawork style. The cats receive names usually based on these personalities, such as one “Psycho” who was apparently so brave that she would chase around local dogs, including pit bulls. Another cat is in the employ of a restaurant-owner who needs him to chase away rats. Briefly, the film shows one example of such a chase. Although captivating superficially, it is also in its own way grim, and makes you wonder if we ought to begin the process of deprogramming predators and making progress toward a peaceful, post-Darwinian biosphere as some have called it. When the technology is ready, anyway. The foreign language is in some ways useful. When a man is shouting, “Come, girl,” to a cat in Turkish and you just hear gobbledygook, you are hearing as the cat does, or at least closer to it, since they do not really understand anything people say; they just know that those sounds mean either attention or food. It is noteworthy that on two occasions in the film, the phrase “Erdo-gone!” can be seen on a wall in plain view with little else in the shot apart from the cat(s). This seems an unlikely coincidence, but who knows if it actually means anything in the context of the film. The soundtrack is understated and atmospheric in all the right ways even if it is nothing unusual for this type of film-making – light, jangly percussion as the human characters (it seems fair to regard the cats as characters in themselves) are describing the cats, while the cats do as they do – fighting, being territorial, chasing and eating, etc. Whereas, it retreats into a more contemplative, ambient sounds when the narrative is drifting and between the vignettes. Like many 21st century documentaries, there is no narrator, but rather, each of the interviewees narrates in turn, which gives the narrative an easygoing, freeform style – although it is by no means directionless. The last 5-10 minutes – the ambient soundtrack and basically a grafted-together compilation of all the cats – dragged on a little much, but that aside there is little to complain about where length is concerned since the film is only 78 minutes. But take from it what you will.